Valet stands help keep your formal clothes looking pristine - and can also save you a lot of valuable time in the morning! You no longer have to rummage around in a wardrobe getting your things together for work or play. They also help keep clothing off the floor and the backs of chairs. We've taken a look at the best men's valet stands on the market in 2019. Here are our top 5. You might assume that all valet (a.k.a "Butler Stands") are all the same. However, there are considerable differences you need to know before you buy. You'll definitely want something that's easy to put up, stay up and lets you hang all the clothes you need on it. Size – you don’t want an occasional-use item to take up too much space; and the ones on our list are all compact so you won't keep bumping into them. Style – traditional wood or modern metal? We’ve included designs in both to perfectly complement your bedroom and decor. Hanging Options – a hanging area with struts for shirts and other garments is a great feature. As is a shoe rack. Not all of stands have these. Storage – These products offer different amount of storage. Some can store your shoes, whilst others have handy trays for cuff links, watches and spare change. Assembly – some of our choices require self-assembly, and we use customer feedback to ascertain how fiddly they are to put together. That’s our list of features to consider, not all that remains is for us to decide which one is best. When searching for the best valet stands, we kept in mind all the key features that we outlined above. This sturdy model is made from tropical Heava wood, which makes it very easy to clean. The wood also has anti-fungal properties which protect your clothes. It can be wiped clean with a soft cloth, so you can keep it usable all the time. There is a stainless steel hanger for belts and trousers, and a handy shelf for small items such as watches, cufflinks and loose change. This one measures 102cm x 47cm x 31cm, which is ​reasonably tall. You can hang a 24" skirt on there and it just clears the ground. It's also pretty thin so it won’t take up too much space, and at just 2 kg it's easy to move out of the way. We recommend standing it somewhere with adequate ventilation if you are hanging damp clothes. It is not collapsible, so bear that in mind. This Premier Housewares Clothes Stand arrives partially assembled. You just need to screw two belts to secure the base to the frame. 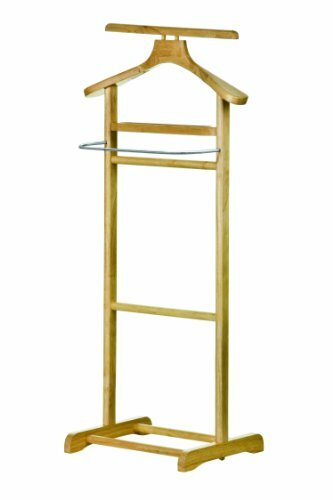 If you're looking for a wooden valet stand that's easy to assemble and can be used as a suit stand - this is a great choice. ​Looking for a more modern valet stand? The "Ronald" from CLP fits the bill and comes in a choice of 5 colours to perfectly match your bedroom decor. ​It would look particularly great in a modern, sleek apartment, and the unusual styling makes it actually an attractive item as well as a practical one. The stand is made from a combination of wood and metal, with the frame being made from durable metal that is finished in a brushed look. ​The frame includes a heavy metal ​base that will keep it upright even when fully loaded. It has a nicely shaped upper hanging section with a neat little shelf for your accessories, too. This one is self-assembly, and cannot be quickly folded down like some of these can, yet it does look good and is very neat, ​measuring 43cm x 28cm x 109cm​ ​it won't take up too much real estate in your bedroom. If wood is really not your thing and you'd prefer a valet stand that won't fall over in a strong breeze, the CP Morgan is a great choice. ​We thought we would include a second model from the CLP range to show you just how innovative this brand can be. ​This is another very modern design, stylish too and would not look out of place among contemporary furnishings. ​Made entirely from metal with a wide base and curved feet, a lot of work has gone into making this as stable as can be. The curved frame includes hanging areas for your shirts and jackets, plus additional areas for trousers and other garments. While there is no additional shelf for your accessories, this is one of the few that also has a shoe rack. Great for keeping all your gear together. The Rufus is available in white or black. Some self-assembly is required though it's pretty straight forward. If you value functionality above a more elegant (read: expensive) valet stand, this could be the one for you. If metal is not your thing, and you something like they'd used in Milan, this wood valet stand from Arredament Italia is just the ticket. Made from beech wood throughout, this is both stylish and functional. It's got not just one but THREE trouser holders, which is great to give a couple of pairs and airing after you get them back from the dry cleaners. There's also a circular accessories holder for things like cufflinks and tie pins. Apart from the design, another thing I really love is it can be wheeled out of the way. And the wheels are no scratch which is good for wood floors. Measuring 44cm x 35m x 105cm, it's not too deep to be placed against a wall and takes up very little room. A downside with this butler stand is it cannot be collapsed for storage. At 105cm it's going to be great for keeping suits wrinkle free, but it can't double for dresses I'm afraid! This last design is tidy, chic and perfect for small spaces. The important thing about this design is that it's got a pretty heavy base, so if you accidentally bump into it in the morning your clothes won't go flying (unless it's been a particularly good night out!). The all-chrome design favours a modern bedroom or even a bathroom (which would prevent clothes getting crumpled after a long, tiring day). The obvious drawbacks with this design is there aren't a great deal of storage options. However, if you're looking for an inexpensive valet stand to hang trousers and a shirt - this is ideal. ​It's hard to choose the best valet / butler stand on our list as much will depend on it's intended use and your bedroom decor. However, if I had to choose just one in terms of cost and functionality, I'd have to go with t​he Premier Housewares ​Rubberwood Valet. ​I love the traditional style and that this particular design has a rack for belts and a shelf for smaller accessories, too.